Vanishing Frontiers documents the changing nature of Mexican immigration and Mexico’s economy. The wave of Mexican immigration to the United States is over. Both China and India send more immigrants. In addition, Mexico’s healthy economy has pushed wages higher leading to a large increase in the middle class. Cheap labor is no longer available in Mexico at least compared to other places in the world like China. Many, if not most, of the border factories have closed. Increasingly, Mexican companies are locating their factories in the United States to stay close to their selling zone. Despite these facts, 25-33% of American citizens dislike Mexico and feel Mexican immigration is a source of unfair trade competition and illegal drugs. Trump’s wall agenda feeds into those feelings. If you are a supporter of Trump, you will not like Vanishing Frontiers’ overarching dislike of his policies. However, there is some interesting information here about how countries move from third world to second. 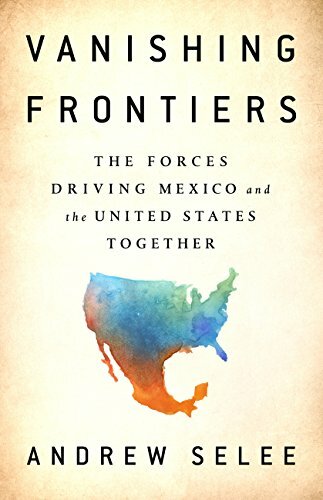 The world has changed with NAFTA and the book explains how the Agreement helps people on both sides of the border to better their lives. 3 stars! Thanks to the publisher, Perseus/Public Affairs, and NetGalley for an advanced copy.